This report documents the current configuration of datastores in your infrastructure. The Utilization chart shows the amount of free and used space on datastores. The Provisioned Space chart shows datastores capacity and the amount of space provisioned to VMs. The Summary table provides configuration details for each datastore, including the datastore capacity, amount of free space, amount of provisioned space, provisioning ratio (datastore capacity against provisioned space) and free space usage trend. Click a hyperlink in the Free Space Usage Trend column table to drill down to daily information on total capacity, the amount of used and provisioned space, and the number of VMs residing on the datastore. The Top 3 Largest VMs section shows VMs that consume more storage space than other VMs. 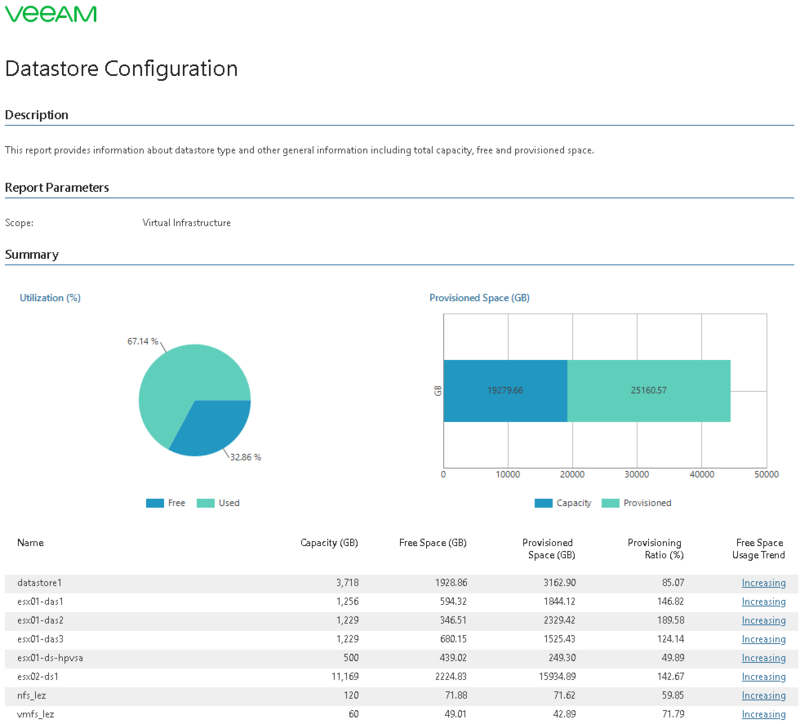 The General Information table provides information about the datastore owner, datastore type, file system, block size, and the number of VMs residing on the datastore.